Kibbutz in Upper Galilee dedicates synagogue in memory of IAF navigator and first Orthodox female pilot Tamar Ariel. Kibbutz Sde Nehemia in northern Israel dedicated a new synagogue this week, in a ceremony attended by rabbis, public figures, and kibbutz residents. Sde Nehemia is a secular kibbutz in the Upper Galilee. The new synagogue, named "Moreshet Tamar," was dedicated in memory of Israel's first Orthodox Jewish pilot, Tamar Ariel. Ariel served as an Israeli Air Force navigator. She died in a Himalayan blizzard in 2014. 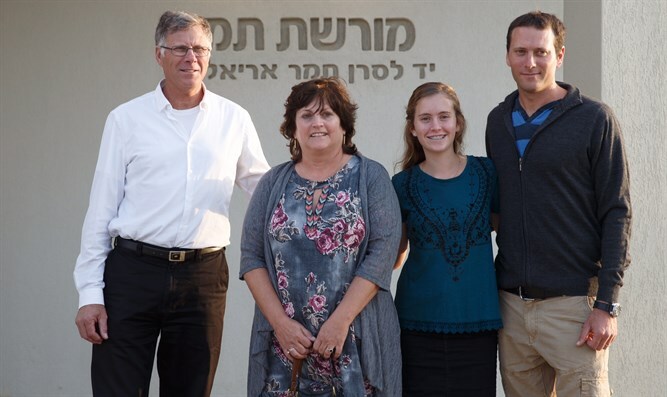 The initiative to build a synagogue came from kibbutz resident Gideon Shelah, whose son Yishai became religious and served as Ariel's commander. The synagogue itself was built with the aid of the "Ayelet Hashachar" organization, which works to build synagogues in kibbutzim around Israel. One of the major donors is religious philanthropist David Hagar, who is also one of the major supporters of the IDF's haredi Netzah Yehuda Brigade. The synagogue also received funding from Israel's Religious Affairs Ministry, and from an internet-based crowdfunding campaign. Among those attending the event were Religious Affairs Minister David Azoulay (Shas), Kiryat Shmona Mayor Nissim Malka, and Religious Affairs Director-General Oded Felus, as well as Knesset members, public figures, members of Ariel's family, and residents of Sde Nehemia. Shelah sees the synagogue's dedication as a form of emotional closure. "My son Yishai was Tamar's commander, and they spent long hours together in the pilot's cabin. I also knew Tamar, not well, but I would meet her in the synagogue," he told one of the interviewers.